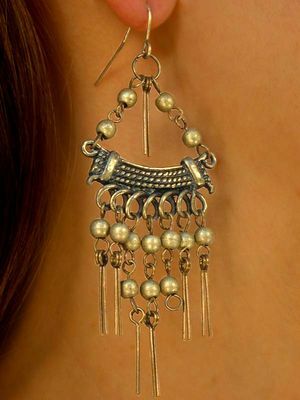 Brass Finish Earring Assortment Includes Two Different Styles. One Pair Is Decorated With A Vintage Design That Suspends Multiple Chain Drops. The Second Pair Displays Cascading Bead & Rod Drops. 1st Pair Measures 3"L x 1"W.
2nd Pair Measures 3"L x 1 1/4"W.